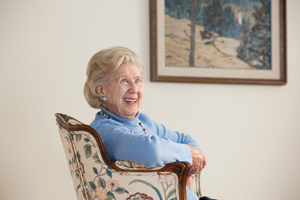 Retired professor Gertrude “Gee-Gee” Joch Robinson ’50 was born between the two world wars in Germany. The first chapter of her life set a pattern for the fascinating journey that followed. That template gave her the talent to look change in the eye with courage. Robinson travels in a telephone conversation with Proustian speed from the huge mounds of snow in Ontario, Canada, where she now lives, back to war-torn Hamburg in Nazi Germany, where she was born to a German father and an American mother from Chicago. Robinson’s German girlhood was right in the heart of wartime. Her mother’s garden is one sweet memory from that ravaged period. Meanwhile, life was turned upside down. Her school was converted into a military hospital, which the girls had to clean. The parents of five other friends arranged for a non-Nazi teacher to teach a philosophy course, while the local school was out of commission. Her father’s shipping company lost all its ships, which were torpedoed by the Allies. When the war ended in 1945, Germany was in shambles, and the people were starving. But the arc of Robinson’s life was about to take her to America, the other half of her heritage. “We were lucky to be able to leave in 1946, on a Liberty ship that had transported American solders only months earlier,” she says. “We sailed from Bremerhaven, Germany, to which we were transported in a cattle car, crammed in like sardines.” The contrast of the arrival in New York and seeing the Statue of Liberty loom over the water was an immigrant epiphany. A year later, Robinson entered Swarthmore. She found the campus enchanting in its quiet Quaker way. For sure, it could not have been more different from Hamburg. So she did, graduating with high honors. 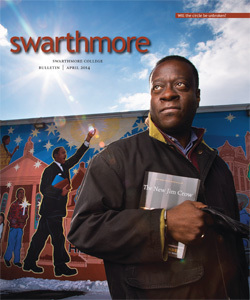 Swarthmore’s seminars, modeled on the Oxford scholarly style, came easily. Like many students in that era, she met her spouse, Thatcher Robinson ’50, now deceased, at college, and they were married soon after graduation. Then began the long game in academics, the game that Robinson and other women of her generation faced if they aspired to be both professors and mothers. The Robinsons moved to Chicago, where, Gee-Gee recounts, “I was highly pregnant and doing a master’s degree in philosophy—writing on the concept of verification in [Bertrand] Russell and [John] Dewey.” The University of Chicago was as academically demanding as Swarthmore. But that paled in comparison to her Ph.D. adventure. She received a doctoral grant and invitation to go to Belgrade, Yugoslavia, with her three small sons, to study President Tito’s news agency TANJUG and the new type of socialism he was introducing to the world. This thesis earned her a Ph.D. in 1968 from the University of Illinois. The Robinson’s marriage broke up shortly after, and she became a single mother, she says. Her distinguished career unfolded at McGill University in Montreal, her academic home, where she first joined the faculty as a professor of sociology in 1970. More change was in store when she became a leading member of the graduate program in communications, which she directed four times during her 30-year career. She was in the vanguard of pay equity for women professors, after realizing that men were paid more for the same work. Robinson was a trailblazer who broke through the glass ceiling. Working across disciplines, including women’s studies, was another of her hallmarks. Vigorous at 86, Robinson lives in a retirement village near her youngest son, a professor of fish biology at the University of Guelph. Twice a week, she goes to a tai chi class and walks at least a half-hour on cold, wintry days. Speaking brightly of the spring, she plans to return to Swarthmore in June for her class reunion and to celebrate the College’s 150th birthday. It has been several chapters of a full life since she saw it for the very first time, in fall’s light.